The Met Museum, among others, offers lesson plans and teaching resources. Have a good source for lesson plans? Share below in the comments! 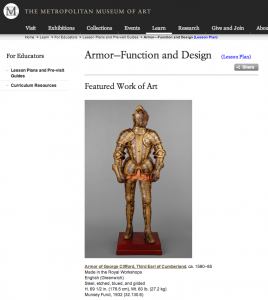 Ed note: This week’s guest post comes from Nancy Ross, founder of Experiments in Art History: Teaching with Digital Tools. Assessment (5-7 minutes). I ask my students a question and they have to respond in writing. These questions generally have to do with the artistic conventions of the movement we are studying. I usually allow them to discuss the answer with each other and to use whatever tools or materials they have with them. Doing the assessment first thing forces my students to do the reading and show up on time. Scores for the daily assessment count for 40% of a student’s grade, so they have to show up (this is a problem at my college). Presentation (5 minutes). This semester, my survey students each had to sign up to give a presentation, with one presentation per class period. The presentations start one quarter of the way through the semester, so they can get to grips with survey-level art history before they have to present. I focus on one work of art during each class period, so they sign up for their favorite work of art. These presentations serve as an introduction to the work of art and they have a clear idea of what is expected for these. So far, so good. I don’t feel too bad about requiring presentations. When I was an undergrad at the University of St. Andrews (Scotland), we had to give a 20 minute presentation each semester, starting in the first year. Terrifying and a tremendous learning experience. Slides and discussion (35 minutes). I start my audio recording, to post later on Canvas as an mp3, and we review answers for the daily assessment question. This leads into the slides and first slide is always a map, followed by the key work of art for the day. I prefer to teach by facilitating discussion, so I ask questions and students answer. I usually bring out a comparison to illustrate a larger point. My high school used the Harkness method of teaching and I like to think that I’m doing Harkness on a large scale in my classroom and without the Harkness table. Students also ask questions, which other students and I answer. Two sections of the same class will cover the same material, but in a different order. I steer the questions to make sure we’re covering all of the bases. Review (5 minutes). I ask students why this key work is important and I want them to come up with three reasons. This serves as a review and also places the key work in a larger context. Knowing three reasons is required for tests and essays. I end the audio recording. I started this post by telling you that I don’t have a lesson plan, but perhaps that isn’t really true. I have a very clear plan, but I don’t write it out. When I first started teaching at Dixie State College, which just became a university, I thought I had to model the teaching that I received at St. Andrews and observed at the University Cambridge when I was a Ph D student. Those lectures were thoroughly prepared and then read. I tried to do that during my first few weeks, but it was extremely frustrating and time-intensive. I wrote overviews and visual analysis, trying to write out every word of the 150 minutes I lectured each week. It wasn’t working for me and I was pretty sure it wasn’t working for them. It felt artificial and I had no idea what my students were learning. I also required my students to write one essay each week, for the entire 15 weeks of the semester. That was standard for Cambridge undergraduates and I thought I was helping my students at Dixie by holding them to the same standard. I figured that the complaints would stop eventually. After the difficulty and failures of that first year, I realized that I needed more feedback from my students, which I would be able to get through discussion. I also needed to compel them to attend class and do the reading, and so I implemented daily multiple-choice quizzes that later turned into short writing assessments. More recently, I learned that my students will produce higher quality work for other students than they will for me. Now I require presentations. I love to hear my students teach other students and have been surprised with the high standard of work. I do plan out my lessons – probably more than I necessary! I could prep for forever, which is something that I’m trying to control for the sake of efficiency. Since my university is on a quarter system instead of a semester system, the lectures that I teach are between 85 and 125 minutes long, and I feel like I need to have some structure in order to utilize the time well. My lessons are very question and discussion based in many respects, but I like to have those questions or concepts written in PowerPoints with the accompanying image(s). I don’t usually look at my notes when I’m in the front of a classroom, so I like to have the PowerPoint help keep me organized and on track. I make these PowerPoints available to students through our LMS, and several students find them to be a helpful resource. In addition to PowerPoints, I often end up to showing students additional images or details through ARTSTOR, Google Images, or the Web Gallery of Art. I like to have my discussions be a little malleable; sometimes student questions and responses will lead me to pull up an image that I didn’t plan to discuss, but the image relates well to the discussion-at-hand. This is the first quarter that I have required presentations in my classes. So far it has been successful, and I agree that student will produce higher quality work when they need to speak in front of their peers. However, I’ve realized that I need to cut back on the information that I want to cover during the remainder of our class time. I feel like these presentations are helpful, but they also have set me a little behind the schedule I anticipated when I created the course syllabi. Next time, I’ll be a little more prepared to scale back a little bit on my end. I think it’s really beneficial for the students to teach their peers, instead of just me. Monica – thanks for sharing! Your classes are so long. Anyone else teach on a quarter system? Monica, thanks so much for sharing your lesson plan! I think the student presentation model is a really useful one – it’s a great skill for students to practice and as both you you say, it also makes the point that many voices are welcome in the classroom. Has anyone any advice for student presentations in jumbo classes eg. when there are 45+ students in a class? Is it impossible, or are there group presentation models that can work? michelle – my students have the option of making a video instead of the more traditional standing in front of a classroom and presenting in person. You can post multiple videos on an LMS for people to watch in their own time and possibly comment on. Video is a great plan Nancy. Whether posting to a class blog, or canvas, I think this may be my route forward. We have a guest poster, Virginia Spivey, who’ll be writing on students making museum podcasts as their “presentation” which seems exciting to me.